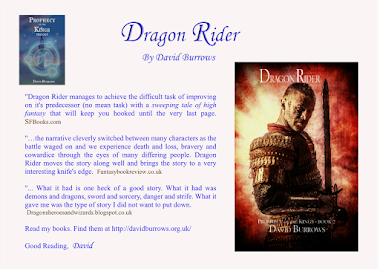 Have a shot at my competition at http://davidburrows.org.uk/ and win a book. It's dead easy. Honest. Check out the penguins. It's great to watch. A little cruel perhaps, especially the Rock Hoppers. Took over 4 hours to travel around 50 miles yesterday. My sympathy to anyone on the M4 and M25 last night. The competition on my website http://davidburrows.org.uk/ - you should be able to "find" the mistake. 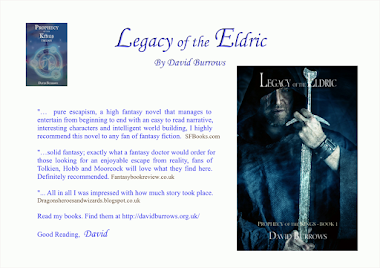 I hope that gives you a clue to win my book Legacy of the Eldric. Check out my website for details. Olympus Has Fallen http://olympusmovie.com/ is a very entertaining film. I thoroughly enjoyed it. The suspense is good and the attack on the White House is really well done and more than a little bit scary. Overall, the film is a little like Die Hard in some respects, but it's still very entertaining. The ending has some flaws but nothing too detracting. It has a lot of action which tallies well with the script. Bit worrying that North Korea are the bad guys, especially at such a fragile time. It is also worrying that it may give them some ideas. Interesting to note the Brits sacked the White House in 1812. Naughty people! Oblivion http://www.oblivionmovie2013.com/ has some pretty poor reviews but i enjoyed it. It's quite slow at times but the story is interesting and enjoyable. Tom Cruise plays the part well, despite a lot of criticism from some reviews. It tries to have a shock revelation but it's not in the same league as 6th Sense. The sheer scale of the film definitely is mind numbing. The effects make up for a thin script. Having said that it is enjoyable, but probably mainly for Sci Fi fans. Of the two I preferred Olympus Has Fallen. Two of Sorrento, one of the forum in Pompeii and one from Ravello looking down on Amelfi. Very interesting coastline. Rugged with twisting roads. Just come back from Sorrento, Italy. It's our 112th wedding anniversary, in wife years of course. Pompeii is amazing. The spot above was very tranquil, a peaceful spot give the violent history of the location. It's hard to visit without remembering all the people who lost their lives, but it is an amazing archaeological site. The ruins are fantastic and show how well some Romans lived, with their central heating and rich lifestyles. Some of the remains are unbelievably well preserved, given they are nearly 2000 years old. Sorrento itself was gorgeous. The whole area is a mixture of steep cliffs and buildings perched precariously upon them. The roads are dreadful. We went on the Amalfi Drive which everyone recommends. Really interesting (in terms of twisty one way roads) and stunning views. Well worth a visit. 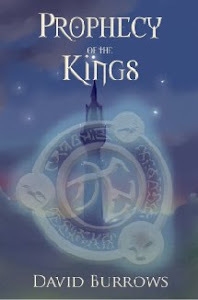 Congratulations to Claire for winning the March competition to win a copy of my trilogy, The Prophecy of the Kings. A copy is in the post. It's a simple competition. 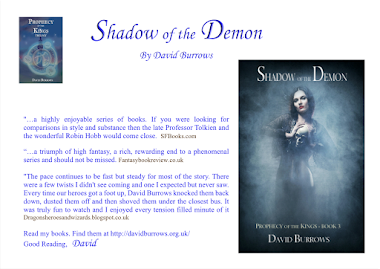 I’ve introduced a deliberate mistake on the first page of my web http://davidburrows.org.uk/. Find it and email where you found it and you will be entered for the prize draw. My email address is on the front page (click here).